A legend in the Putnam law enforcement community died suddenly Tuesday. Undersheriff Peter Convery was 65 years old. Convery suffered a massive coronary at his home and despite efforts by his wife, a registered nurse, EMS providers from Mahopac and … Please login below or purchase a subscription to the Putnam County Courier to access this content. Cullen Malzo gets a hug from one of the girls he saved from Lake Mahopac during a reunion at the crash site. Julia Brower called Cullen “my hero.” Two 17-year-old Mahopac girls are lucky to be alive following a dramatic rescue Thursday ni… Please login below or purchase a subscription to the Putnam County Courier to access this content. Above: Carmel High School freshman, Jack Recher, 14, plays taps during the Kent ceremony for the 5th consecutive year. 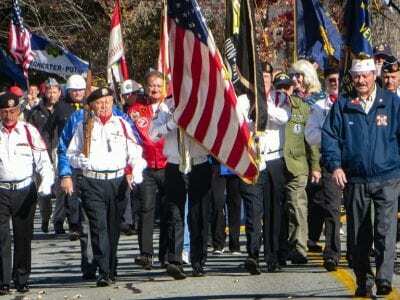 Top: In Mahopac, a parade along Lake Blvd. features veterans from many wars and skirmishes. Golden sunshine, glorious blue skies an… Please login below or purchase a subscription to the Putnam County Courier to access this content. Army specialist Andrew Hopkins leads in saluting the flag. 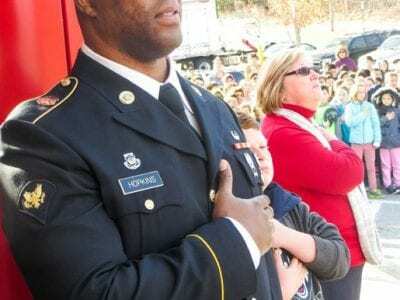 U.S. Army Specialist Andrew Hopkins returned to his alma mater Thursday as the Brewster School District kicked off Putnam’s Veterans’ Day ceremonies 24 hours early. Hopkins, who w… Please login below or purchase a subscription to the Putnam County Courier to access this content. The Fahnestock Winter Park’s 7th Annual Cross Country Ski & Snowshoe Swap fundraiser sale is scheduled to take place on Saturday, Nov. 19, from 9 a.m. to 12:30 p.m. All proceeds will directly benefit the park’s popular ski, snowshoe … Please login below or purchase a subscription to the Putnam County Courier to access this content. We said last week that Sen. Charles Schumer carried Putnam for the first time in his career on his way to reelection this year, but an alert reader notes that he’s actually carried Putnam twice before. In 2004, Schumer beat his opponent Howard… Please login below or purchase a subscription to the Putnam County Courier to access this content. I am grateful for all of the concerned taxpayers of Putnam Valley for getting the word out and educating the community in regards to the library issue called Proposition 1. A special thanks goes out to the individuals who put signs out, participated… Please login below or purchase a subscription to the Putnam County Courier to access this content. A move by Legislator Dini LoBue to change county policy, allowing for public discussion at full meetings of the Putnam Legislature, fell on deaf ears Monday evening at a meeting of the legislature’s Rules Committee. LoBue, who chairs the committee, … Please login below or purchase a subscription to the Putnam County Courier to access this content.